Advertisers are retail clients that sign up under a white label reseller that communicate with end-users through the use of various tools available on our system. To create an advertiser, navigate to Advertisers -> Create New. Pre Paid - When checked, the advertiser pays for the entire month up front. When unchecked, the advertiser pays for the previous month's usage at the beginning of the following cycle. 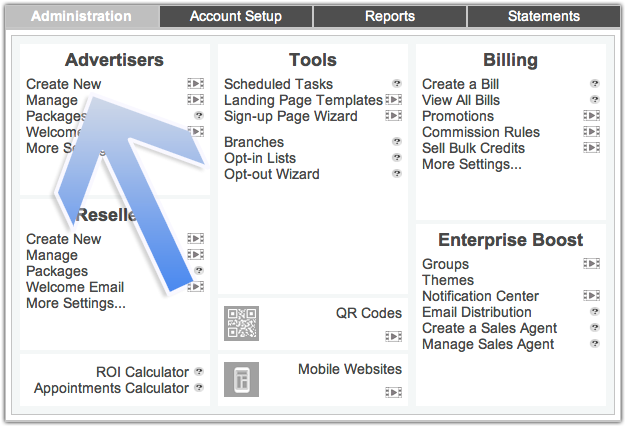 Enable Auto Charge - When checked, the platform will automatically charge the advertiser's credit card each billing cycle. Do not send a welcome email - When checked, the welcome message containing the username and password of the advertiser will not be delivered to the advertiser's email address.